Amerisleep’s latest infographic offers the public tips on sleeping safely should a zombie apocalypse ever become reality. AMC’s hit television series The Walking Dead is set to premiere season 3.5, and with that many fans will be getting back into the world of Walkers and Biters. Amerisleep, a memory foam mattress retailer, seeks to entertain and engage with their latest infographic, which takes a humorous approach to the pop-culture Zombie Apocalypse phenomenon. 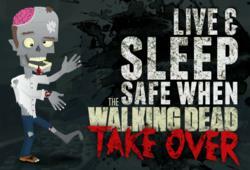 The infographic is titled “Live & Sleep Safe When The Walking Dead Take Over” and exhibits custom, unique illustrations and original content. Cartoonish elements give the work a light-hearted feel, while dark and gritty graphics invoke a post-apocalyptic feel. The theme looks at what steps survivors might take to ensure safe sleep in a world ridden with walking dead out for fresh flesh. Each idea contains several “pro tips” designed for the advanced survivor, rated on a scale of 1-5 zombie heads for effectiveness. The first tip offered involves beefing up security via blocked doors, barbed wire, and other barriers, with a wall of cars rated as the most effective barricade. Next, viewers learn about traps designed to catch and stall Walkers. Weapons are also covered and rated for life and power, with explosives clearly taking the top slot. Top locations for secure sleeping focus on security and elevation, as Walkers have a bad reputation for climbing. Places like watch towers and fortresses prove ideal in the illustration, as does the concept of sleeping in shifts while group members stand guard. The piece also reminds survivors that Walkers do not sleep, though they may go into an idle state only to regenerate when prey approaches. Ultimately, the infographic aims to teach customers how to survive and sleep stealthily, all while raising brand awareness. The work debuted earlier this week and is receiving positive reception on social media and with customers. Amerisleep also hosts other creative infographics, and resources on sleeping and mattresses in addition to their product offerings. Amerisleep, owned by online retail collective OneMallGroup, retails highly-rated memory foam mattresses, adjustable beds and related accessories, in business since 2008. The company defines itself by exclusively offering American-made, environmentally sustainable products at competitive prices. Visit Amerisleep.com for more information.